As many of my readers already know, I was a founding member of the “The H-Team” a collaborative group of award-winning and bestselling historical writers who produce novels jointly. Troy: city of gold, gatekeeper of the east, a haven destined to last a thousand years. But the Fates have other planes–the Fates, and a woman named Helen. In the shadow of Troy’s gates, all must be reborn in the greatest war of the ancient world: heroes and cowards, seers and kings, innocent and guilty. But who will lie forgotten in the embers, and who will rise to shape the dawn of a new age? 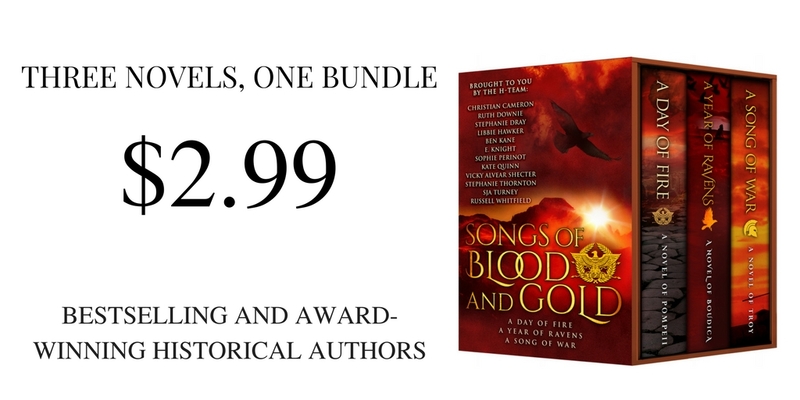 One of the best things about being a historical novelist is connecting with other writers in the genre, getting to know their work and then introducing them to you–my readers and friends. 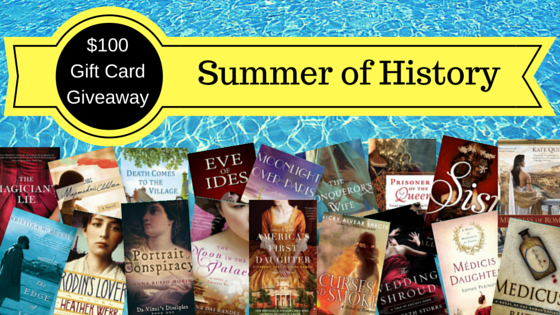 That’s why I am in love with the event I am announcing today: THE SUMMER OF HISTORY GIVEAWAY. Not only do you have the chance to win my novel Medicis Daughter (if it is not already in your collection), you have the opportunity to win books and prizes (including a colossal $100 gift card) from 18 other top writers of historical fiction. What could be better than new books just in time to let you kick back, put your feet up, and enjoy the warm weather with a great book. Nothing. Entry is simple. Just follow the link and Pick five books that you’d like to win! It all begins with a son–Vicky Alvear Shecter’s story “The Son” to be exact, about a young man who is looking for love in the proverbial wrong places while also trying to hang on to the good opinion of his famous uncle, Admiral Pliny. In bustling Pompeii he meets a whore named Prima–a woman readers will come to know better in Stephanie Dray’s tale. While Caecilius is sneaking around the city on pleasure bent, Aemilia the heroine of my story–THE HEIRESS–is counting down the days to her wedding. Betrothed to her father’s best friend she knows her duty, but also her heart which lies elsewhere in the keeping of a handsome young artist. While Faustus prowls the Villa of the Mysteries looking for his Aemilia, author Ben Kane’s Lucius Satrius Rufus–title character in THE SOLDIER–has a hangover and massive load of debt to manage. Can a win by the gladiator he owns straighten things out? Senator Marcus Norbanus in Kate Quinn’s THE SENATOR has his own problems–among them an aging body and a waning will to live. He is in Pompeii on official business when he has a run in with Caecilius’ whore Prima. While he is recovering from his encounter with the jug, young mother-to-be Julilla, heroine of E. Knight’s THE MOTHER, is on her way by litter to her friend Aemilia’s house to help her dress for her wedding. A journey she does not complete. Who will survive and who perish? Readers will have to wait for Stephanie Dray’s THE WHORE to know for certain. There they will reconnect with Prima and spend time with her rosy, blonde and good-natured sister Capella a woman called to serve the Goddess Isis. Intrigued? Mark your calendars for November 4th. A DAY OF FIRE: A NOVEL OF POMPEII will be available in e-book and paperback. Currently it can be pre-ordered in the e-book format. Today we are precisely FOUR WEEKS away from the Launch of “A Day of Fire,” the high-concept novel-in-six-parts that I’ve written with Ben Kane, Kate Quinn, Stephanie Dray, Eliza Knight and Vicky Alvear Shecter. The novel is already available for pre-order at Amazon, but in honor of the countdown to release, I’d like to share some lovely illustrated quotes to give you a taste of the tales the volume contains. Visit “A Day of Fire’s” Facebook page to learn how you could win the book by correctly identifying which author wrote which quote. Prepare to take a leap back in time with me to 79 AD, when Pompeii was a lively resort flourishing in the shadow of Mount Vesuvius at the height of the Roman Empire. When Vesuvius erupted in an explosion of flame and ash, the entire town would be destroyed. Some of its citizens escaped the mountain’s wrath, some died as heroes . . . and A Day of Fire will tell their stories. The book is a high-concept piece—a novel in six parts by Stephanie Dray, Ben Kane, Eliza Knight, Kate Quinn, Vicky Alvear-Shecter, and yours truly. We will bring you overlapping stories of patricians and slaves, gladiators and heiresses, villains and heroes who cross and recross paths during Pompeii’s fiery end. But who will escape, and who will be buried for posterity? My story—The Heiress’s Tale—will lead the collection. So mark your calendars! A Day of Fire releases on November 1, 2014.